This essay originally appeared in a catalog produced by Kitty Maryatt’s Fall 2014 Core III class (all sophomores) at Scripps College for the exhibition titled CBAA Members’ Exhibition, in the Clark Humanities Museum, shown January 7 to February 17, 2015. Cosmology is deﬁned as “the science of the origin and development of the universe”, pertaining to great mystery and historical depth. While Helen Hiebert’s artist book Cosmology does not attempt to tackle any astronomy, theory or particle physics, it does function as an elegant tribute to the universe and its delicate mysteries. 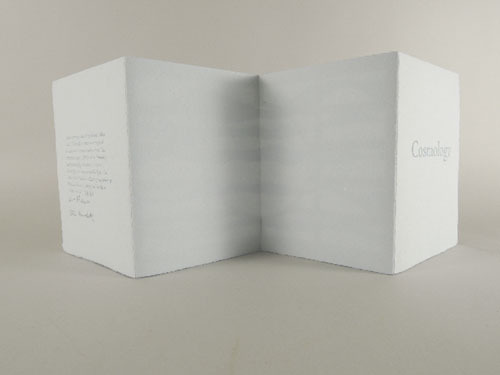 Helen Hiebert’s creamy paper and conceptual structure coupled with Carl Adamshick’s serene poem evoke the ﬂuidity of time and inaccessibility of memory. 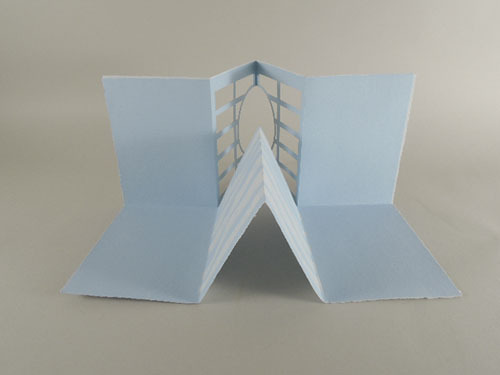 Hiebert’s unusual book structure and the space she creates within the book helps to inject additional meaning into the book, and differentiate it from other artist books, and ultimately it is because of this creation of space that the book is so successful. 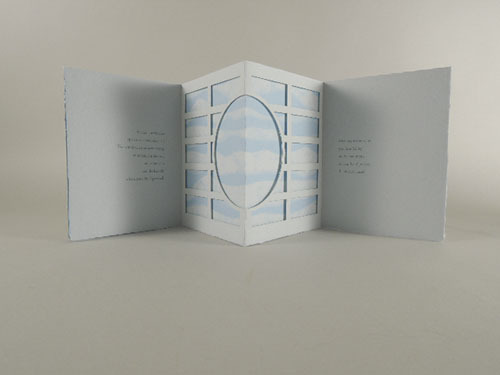 Essentially, the book can be expanded to create a small ‘square’ of space within the middle of the book, allowing for the intricately cut paper frame to create what looks like a window within the book. 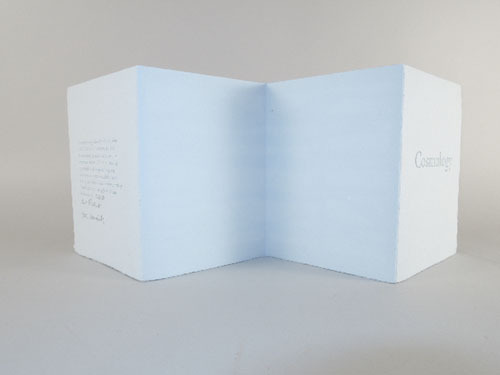 This renders the book three-dimensional, and in doing so alters its existence as simply one of a passive work of text into an active, engaging art piece that has a dynamic capability. The three-dimensionality of the book also helps to draw attention to the beautiful paper that Hiebert has made. and even the background story behind the geometric composition of the frame helps to instill the frame with additional meaning. 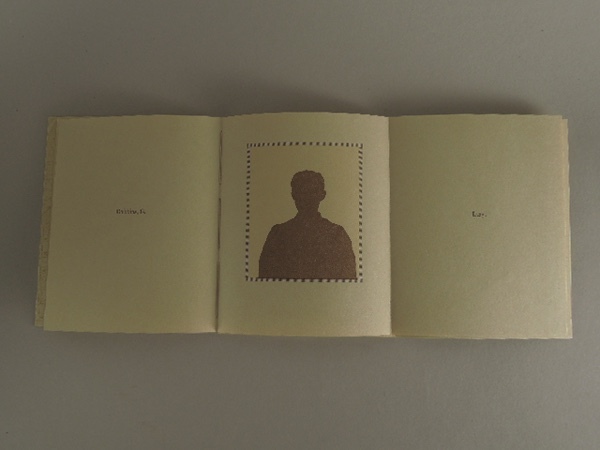 It is meant to be enjoyed as a real, physical space: you can look through the frame, you can look into the frame, and you can look past the frame, and each of these distinctions help elevate the book into the realm of a distinct, unique artist book. 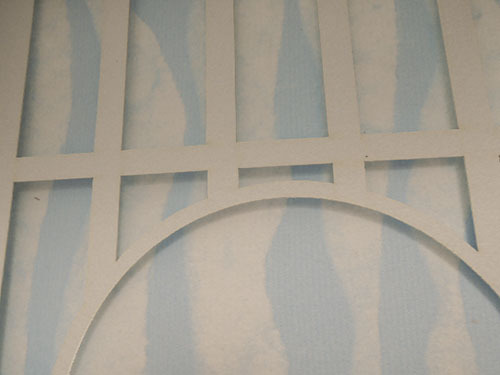 The structure also alters the way in which the book can be viewed. It can be held like a traditional codex, between two hands, but it can also be displayed in an upright fashion, and this helps to transform it into a more permanent structure. These are important considerations when looking at artist books because they exist unlike typical books: they are supposed to incorporate dynamic viewing and Cosmology does just this. where your child grew tall. The sweetness in Adamshick’s diction, as well as the sense of discovery and contentedness that pervades the entire poem, helps point to the same creation of space that the structure does: the explicit meaning in the map, the ocean ﬂoor, the lost city and the mountain. both point to a loss, of time and love and noise. The poem is both exceedingly simple and complex, and it is hard to take away from the poem a particular feeling: but when coupled with the structure, colors, and framing, the poem grows into something meant to be taken less literally and more ﬁguratively: an emotion you are encouraged to feel as opposed to an emotion you are expected to decipher. 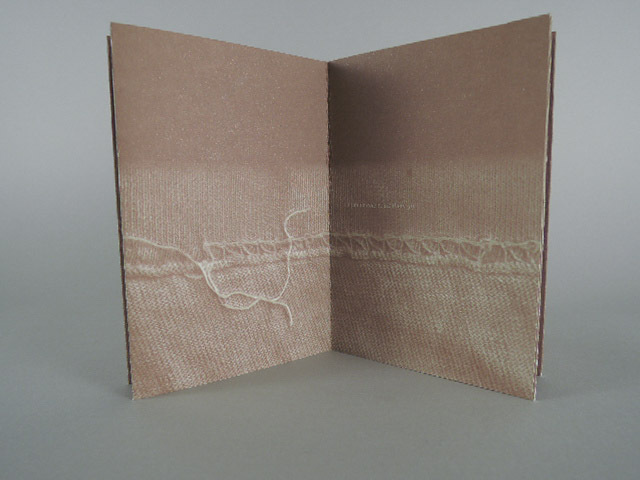 Ultimately, Helen Hiebert creates an artist book that is both simple and complex, gentle and striking. The book creates space and references space, and the integration of these unique characteristics (that are rooted in memory) help to further the poetry by Adamshick. While Cosmology does not deal with many complicated images or scientiﬁc structures, it nevertheless references things both tangible and intangible, through both content and structure. It is an evocative book, one that makes the viewer feel an emotion that is at times unidentiﬁable; and this is the beauty of its ﬁnal form.